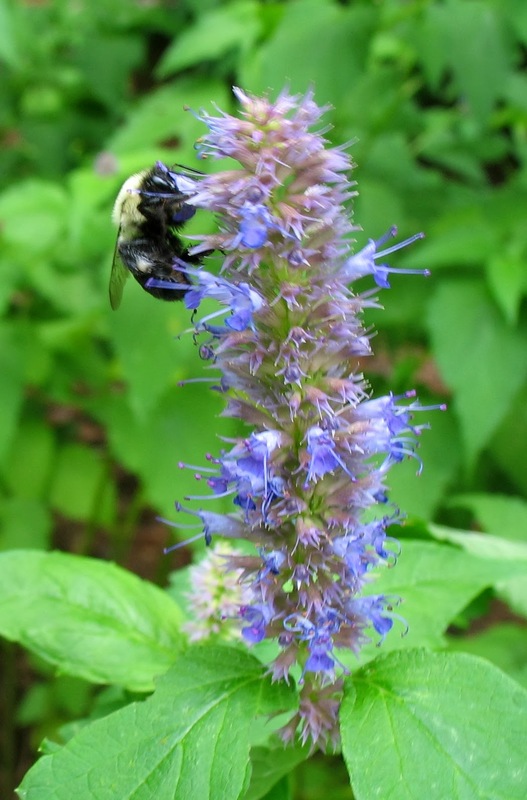 When it comes to native plants supporting pollinators, nectar content is extremely important. The quality and quantity of nectar is what feeds pollinators like butterflies, bees, wasps, certain flies and even birds and bats. I want to make you aware of two other components to native plants that also support these guys: pollen and foliage. It is important to consider all 3 when you decide what plants to choose to support pollinators and even butterflies specifically. We all know what nectar is, so here is a little background on why pollen and foliage are important and why you should consider them when choosing plants to include. Pollen is the dusty yellow stuff that we all know so well from plants that give it up in abundance to support pollination by wind (oaks, pines, mulberries, grasses, ragweed). Insect pollinated plants have heavy pollen that is not wind-blown. These plants have attractive flowers designed to convince insects to stop by and have a snack (or at least have a look). While the insects are browsing they are also providing pollination services by dragging pollen from one flower to another or from stamen to pistil in the same flower. Pollen is actually nourishing itself and many insects eat pollen or feed pollen to their young. Bee bread is a mixture of pollen and nectar that bees create for their young to eat. Some adult insects eat both nectar and pollen themselves. So if you want to support bees, look for plants that have good sources of pollen. Foliage is another part of a native plant that is important to insects such as Lepidoptera, the order of butterflies and moths. Some insects do not eat as adults (they don’t even have mouth parts), but all insects have to eat in their larval form. Butterflies and moths lay eggs on the leaves of plants that they can eat. These plants are known as their host plants. 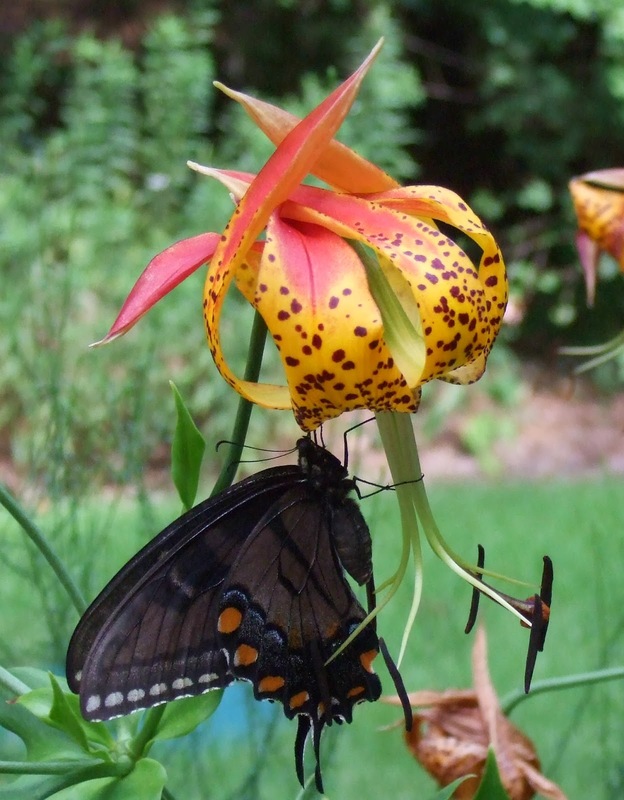 So if you want to support butterflies, look for plants that have host relationships. Some species have multiple hosts and some species host on a single genera. For example, the eastern tiger swallowtail butterfly can lay eggs on wild cherry (Prunus), sweetbay (Magnolia), basswood (Tilia), tulip tree (Liriodendron), birch (Betula), ash (Fraxinus), willow (Salix) and others. In contrast, monarch butterflies can only lay eggs on milkweed plants (Asclepias spp.). 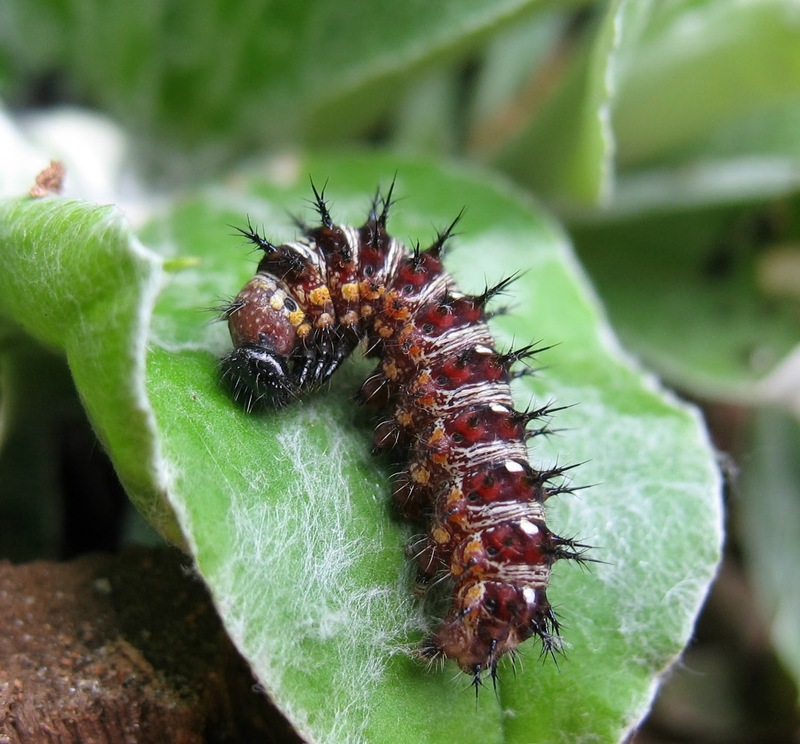 If you want to support the full life cycle of a particular butterfly or moth, foliage plants must be considered. American lady butterfly - all grown up! On Stokesia flowers. So this is all to say that when you are planning a butterfly or pollinator garden, consider these 3 aspects: nectar, pollen, foliage. A fourth consideration is bloom sequence. Some flower should be in bloom all the time, especially if you are supporting bees. 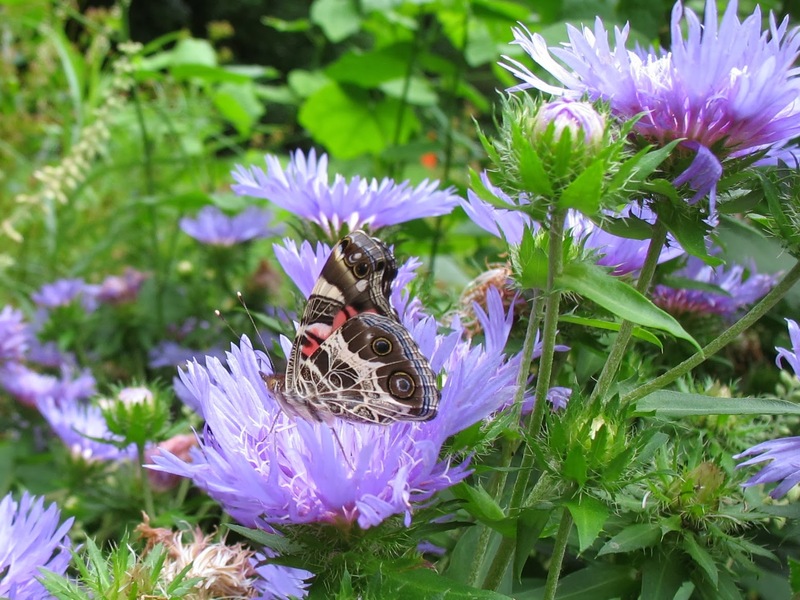 Proper selection and planning will ensure that butterflies and pollinators that stop by will have nectar and pollen available to them throughout the warm seasons. Consider also that you may want to support certain periods like the monarch migration which happens in Georgia around mid-September to early October. 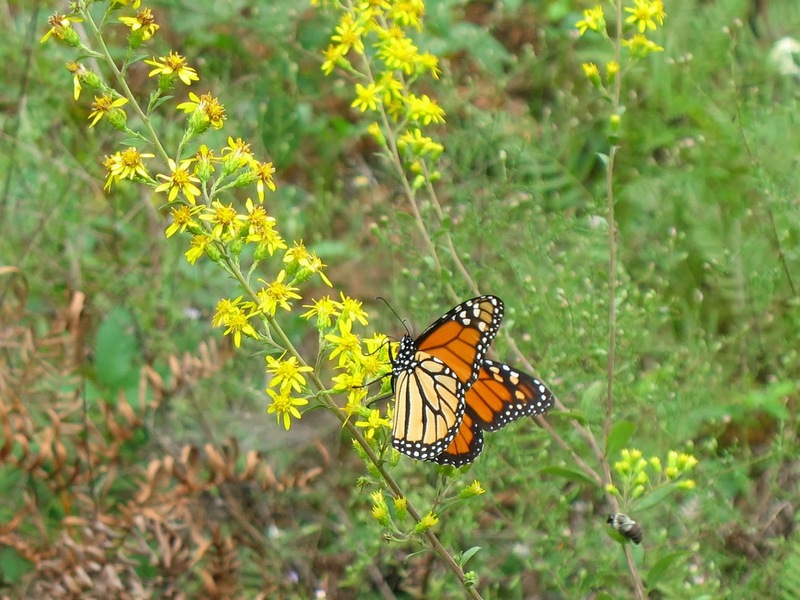 Flowers like goldenrod (Solidago), blazing star (Liatris) and boneset (Eupatorium and relatives) are good nectar providers during that time. It's that time of the year that spring plant sales pop up (thank goodness). So get your lists ready and go shopping! Don't forget my favorite sale - Georgia Native Plant Society on Saturday, April 12th. Come see us! Well done. Love that you included the whys of pollen-loaded plants (and foliage) and not just a list of great stuff. Kudos! If you have limited space and are creating a pollinating garden to attract bees to pollenate a vegetable garden, do you have a few suggestions of plants found in common big box store? Or easy to grow seeds? for Atlanta area?